This November 6, is the most anticipated dinner of the year starring 15 Master Guest Chefs, 25 Michelin Stars, 10 Hosting Chefs from the Best Italian Restaurants in Town. Book your tickets now! The Summit brings together the best Italian restaurants, food and wine producers, Michelin-starred chefs and culinary experts under one roof. It is a great opportunity for Made in Italy firms interested in expanding into the Greater-China market, China and HK based companies representing Italian firms, China and HK based companies interested in investing in Italy. 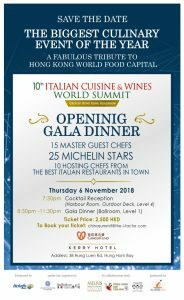 The Summit will have some of the best Italian contemporary Michelin stared Chefs in the best Italian Restaurants of Greater china. It will be a night of fantastic food and wine for all that want to join.